A hamster made a meal out of his new-found-freedom by chewing his way through a cardboard box and hiding in the footwell of his new owner's car. Kathleen Barton, 43, husband Jeffery, 42, and daughter Laura, 14, of Durham, called the AA patrol to help recover the lost rodent from the car on Monday. The family were so pleased to get their pet back safely, they have named him after AA man Bob Fuller. 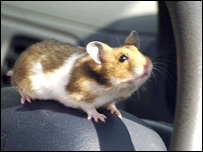 The hamster was bought for Laura after she spent two days in hospital. The family tried to coax the hamster from his hiding place in the blue Renault Clio in Framwellgate Moor. But the rodent remained out of reach as he nibbled on the carpet and wiring. Mrs Barton said: "He kept popping his head out to see what all the fuss was about but as soon as we tried to grab him he ducked down again." Mr Fuller, who has been an AA patrol for 12 years, had to unscrew the dashboard to catch the new pet. He said: "It took about 20 minutes to get him out. "He didn't seem to suffer any ill effects from his experience. It's the shortest and the smallest job I've done."